250 News | Smoke Persists Over P.G. Prince George, B.C. 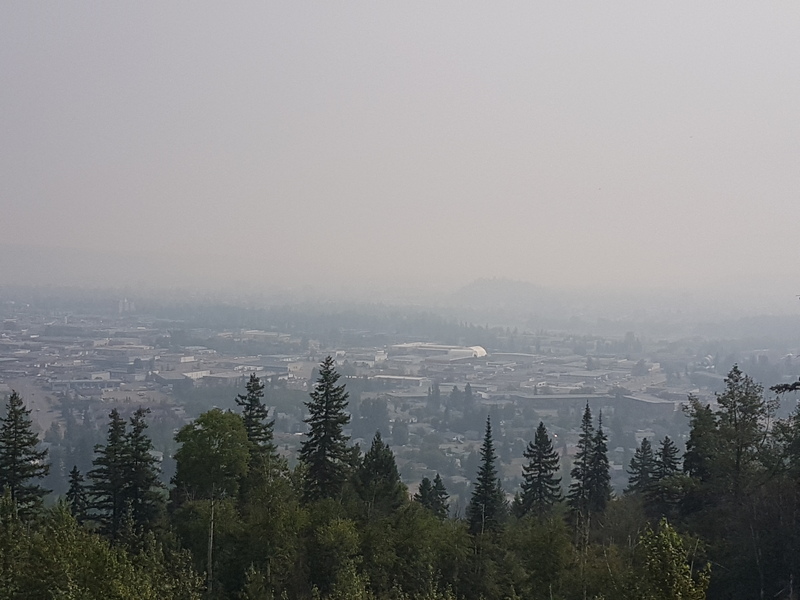 – The smoky skies air quality bulletin remains in effect for Prince George and neighbouring communities. The latest reading for PM 2.5 in Prince George show the levels to be at 91.5 micrograms per cubic meter more than 3 times the Provincial target of 25. The reading for PM 10 was 126.3 micrograms per cubic meter, more than two and a half times the Provincial target of 50. The 24 hour rolling average noted levels of PM 2.5 to be 101.8 micrograms per cubic meters while the 24 hour rolling average for PM 10 was 106.2. .Individuals may experience symptoms such as increased coughing, throat irritation, headaches or shortness of breath. Children, seniors, and those with cardiovascular or lung disease, such as asthma, are especially at risk.